The next challenge for the Global Fact community: calling out governments and political actors that pretend to be fact-checkers. 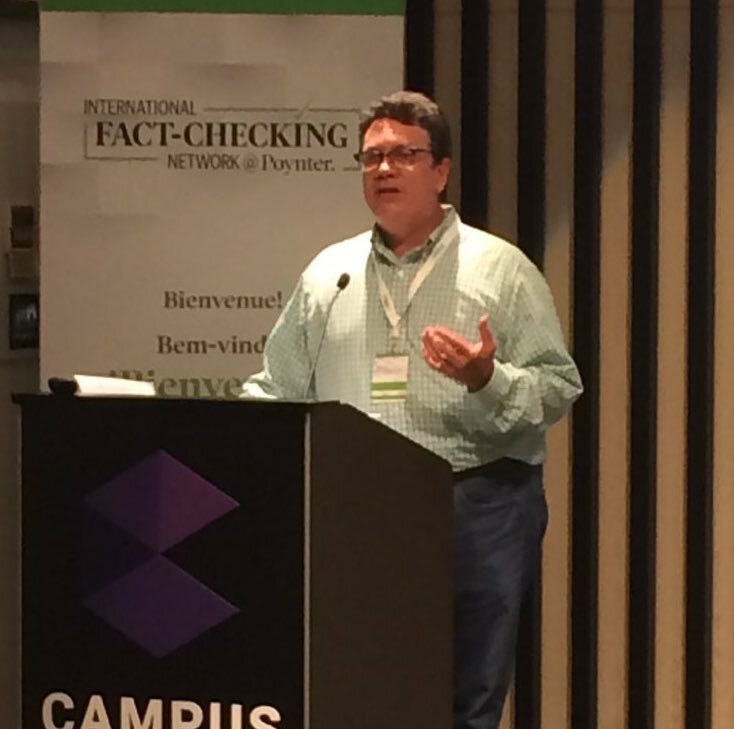 My opening remarks at Global Fact 4, the fourth annual meeting of the world’s fact-checkers, organized by the International Fact-Checking Network and the Reporters’ Lab, held July 5-7, 2017 in Madrid, Spain. It’s wonderful to be here in Madrid. I’ve been enjoying the city the last two days, which has made me think of a giant warehouse store we have in the United States called Costco. Costco where you go when you want to buy 10 pounds of American Cheese or a 6-pound tub of potato salad. Costco also makes a delicious fried pastry called a “churro.” And because everything in Costco is big, the churros are about three feet long. When I got to Madrid I was really glad to see that you have churros here, too! It’s wonderful to see that Costco is spreading its great cuisine around the world! I’m pleased to be here with my colleagues from the Duke Reporters’ Lab — Mark Stencel, Rebecca Iannucci and Riley Griffin. We also have our Share the Facts team here – Chris Guess and Erica Ryan. We’ll be sampling the churros throughout the week! It’s been an amazing year for fact-checking. In the U.K., Full Fact and Channel 4 mobilized for Brexit and last month’s parliamentary elections. In France, the First Draft coalition showed the power of collaborations during the elections there. In the United States, the new president and his administration drove record traffic to sites such as FactCheck.org and PolitiFact and the Washington Post Fact Checker — and that has continued since the election, a time when sites typically have lower traffic. The impeachments and political scandals in Brazil and South Korea also meant big audiences for fact-checkers in those countries. And we expect the upcoming elections in Germany, Norway and elsewhere will generate many opportunities for fact-checkers in those countries as well, just as we’ve seen in Turkey and Iran. The popular demand for fact-checking has never been stronger. Fact-checking is now so well known that it is part of pop culture. Comedians cite our work to give their jokes credibility. On Saturday Night Live last fall, Australian actress Margot Robbie “fact-checked” her opening monologue when she was the guest host. Some news organizations not only have their own dedicated fact-checking teams, they’re also incorporating fact-checks in their news stories, calling out falsehoods at the moment they are uttered. This is a marvelous development because it helps to debunk falsehoods before they can take root. We’ve also seen tremendous progress in automation to spread fact-checking to new audiences. There are promising projects underway at Full Fact in Britain and at the University of Texas in Arlington and in our own lab at Duke, among many others. We’ll be talking a lot about these projects this week. Perhaps the most important development in the past year is one that we started at last year’s Global Fact conference in Buenos Aires – the Code of Principles. We came up with some excellent principles that set standards for transparency and non-partisan work. As Alexios noted, Facebook is using the code to determine which organizations qualify to debunk fake news. I hope your site will abide by the code and become a signatory. But it’s become my mantra because it’s true: When we held our first Global Fact meeting in 2014 in London, our Reporters’ Lab database listed 48 fact-checking sites around the world. Our latest count shows 126 active projects in 49 countries. I’m thrilled to see fact-checking sprouting in countries such as South Korea and Germany and Brazil. And I continue to be amazed at the courage of our colleagues who check claims in Turkey and Iran, which are not very welcoming to our unique kind of journalism. As our movement grows, we face new challenges. Now that our work is so well-known and an established form of journalism, governments and political actors are calling themselves fact-checkers, using our approach to produce propaganda. We need to speak out against this and make sure people know that government propagandists are not fact-checkers. We also need to work harder to reach audiences that have been reluctant to accept our work. At Duke we published a study that showed a stark partisan divide in the United States. We found liberal publications loved fact-checking and often cited it; conservative sites criticized it and often belittled it. We need to focus on this problem and find new ways to reach reluctant audiences. We analyzed nearly 800 references to fact-checking and found a stark divide. Liberal writers like fact-checking; conservatives don't. Conservative writers aren’t fond of fact-checking. They belittle it and complain that it’s biased. They say it’s “left-leaning” and use sarcastic quotes (“fact-checking”) to suggest it’s not legitimate. 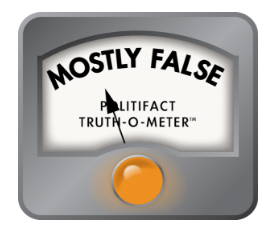 One writer likens PolitiFact to a Bangkok prostitute. To examine partisan differences over fact-checking, we analyzed some of the most widely read conservative and liberal sites. 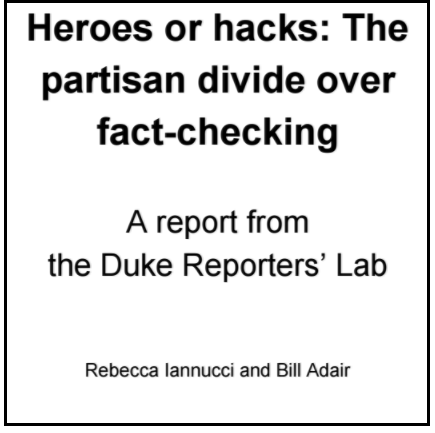 Our students in the Duke Reporters’ Lab identified 792 statements that referred to fact-checkers or their work. We found a stark partisan divide in the tone, the type of references and even the adjectives the writers used. 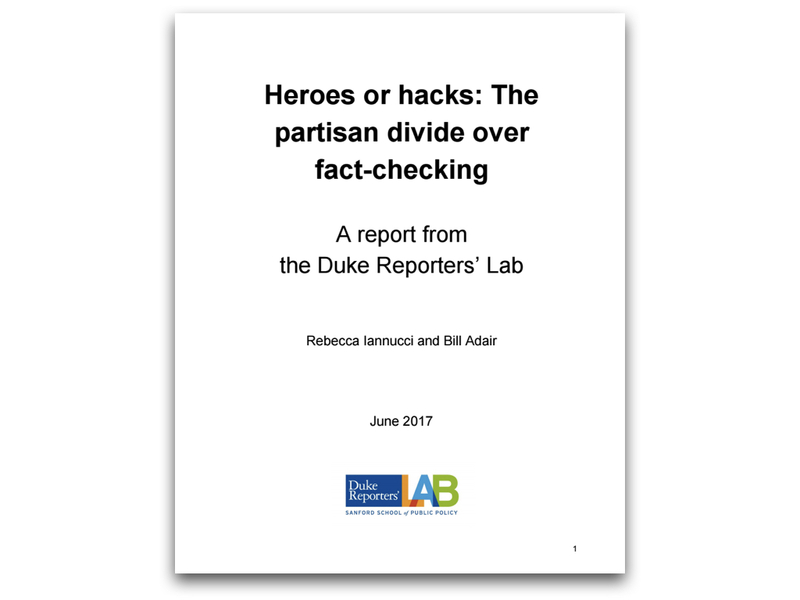 Our report, Heroes or hacks: The partisan divide over fact-checking, reveals a serious problem for the growing number of fact-checkers, journalists who research and rate the accuracy of political statements. They emphasize their neutrality and nonpartisan approach, but they face relentless criticism from the political right that says they are biased and incompetent. Liberal websites were far more likely to cite fact-checks to make their points than conservative sites were. Conservative sites were much more likely to criticize fact-checks and to allege partisan bias. When our student researchers categorized the tone of mentions, we found liberal sites made most of the positive references, while the negative references came primarily from the right. 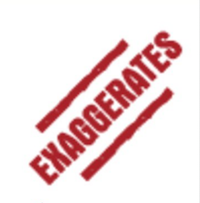 Conservative sites made the most critical comments about fact-checking, occasionally using quotation marks (“fact-checking”) to imply it wasn’t legitimate. We found the most revealing differences in the words the writers used to describe fact-checkers and their work. Our findings indicate that fact-checkers have some work to do. They need to strengthen their outreach to conservative journalists and, particularly, to conservative audiences. The fact-checkers need to understand the reasons for the partisan divide and find ways to broaden the acceptance of their work. 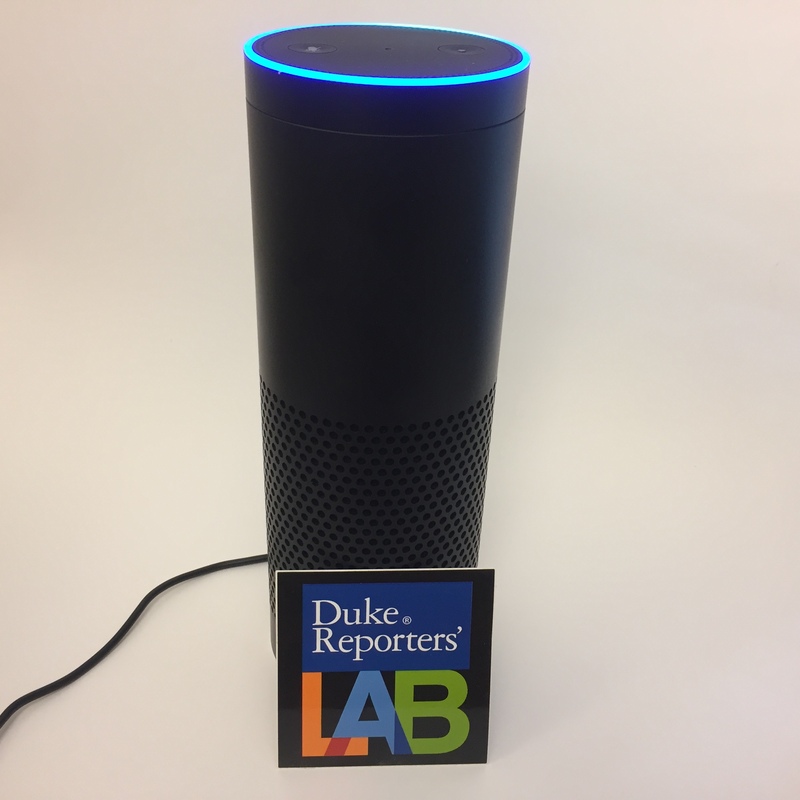 The Duke Reporters’ Lab has created a new fact-checking app for the Amazon Echo. 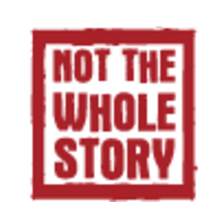 The app is a spin-off of Share the Facts, a project that has expanded the reach of fact-checking. The launch partners are PolitiFact, The Washington Post’s Fact Checker and FactCheck.org. With the new Share the Facts skill, owners of the Echo and other Alexa-enabled devices, including the Tap and the Dot, can “ask the fact-checkers” about claims they hear from presidential candidates Hillary Clinton and Donald Trump, as well as other candidates and politicians who have been checked. We encourage you to try checking candidates’ claims from your couch after watching a campaign ad or during a discussion around the dinner table. Try to use the most important keywords in your question, following the examples above. Share the Facts uses natural speech recognition to analyze and answer your questions from our database of roughly 2,000 professionally curated fact-checks. We scale our results so that they are timely and have the most consensus among our partners. We welcome your feedback on our new Echo skill Share the Facts. Please send your thoughts to Share the Facts project manager Erica Ryan. The Duke Reporters’ Lab has created three new Twitter feeds to help voters keep up with fact-checking during the 2016 presidential campaign. The Twitter feeds feature fact-checks from three partner sites: PolitiFact, The Washington Post’s Fact Checker and FactCheck.org. All three are part of the Share the Facts project, an effort to expand the reach of fact-checkers using a shareable widget that summarizes their conclusions. Share Trump Facts (@share_trump): This feed includes all fact-checks of Republican nominee Donald Trump. 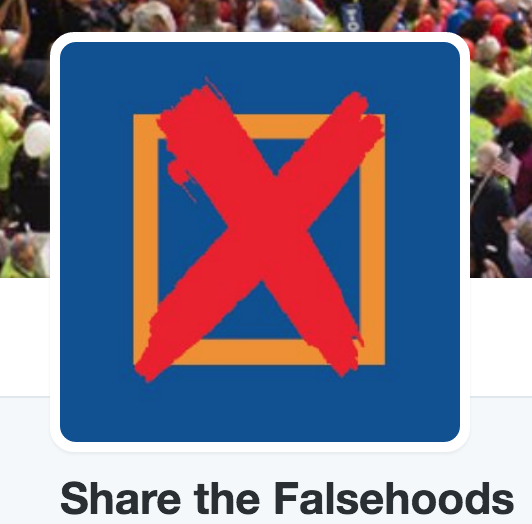 Share Clinton Facts (@share_clinton): Like the Trump feed, this account will update with all fact-checks of Democratic nominee Hillary Clinton. These three new Twitter feeds join the main Share the Facts Twitter account (@sharethefact) and the project’s Facebook page in offering easy ways to find and share fact-checking. As Hillary Clinton became the first female presidential candidate to accept the nomination of a major political party on Thursday night, fact-checkers dug into the talking points and attack lines that peppered her speech. PolitiFact, The Washington Post and FactCheck.org were among those sorting the truth from the fiction. Here’s a roundup of five of their fact-checks that you can share on Facebook and Twitter using the Share the Facts widget, created by the Duke Reporters’ Lab and Jigsaw, a technology incubator within Alphabet, the parent company of Google. You can also embed them in articles and blog posts. PolitiFact was able to verify all of the examples Clinton cited – except for the picture frames made in India. It also found some Trump-branded products made in the U.S., such as his signature “Make America Great Again” hats. These numbers are based on older data, according to The Washington Post. “There is increasing evidence that income imbalance has improved in recent years as the economy has recovered from the Great Recession,” it reports. The most recent calculations show the top 1 percent got 52 percent of the income gains between 2009 and 2015. 4. “Nearly 15 million new private-sector jobs” have been created since President Obama took office. Want to embed fact-checks like this in your articles and blog posts? Contact us for the easy instructions. The Republicans kept fact-checkers on their toes during their convention in Cleveland. Next, it’s the Democrats’ turn as they gather in Philadelphia to nominate Hillary Clinton. Below is a preview of some talking points you may hear during the Democratic convention and how the fact-checkers at PolitiFact, FactCheck.org and The Washington Post have rated their accuracy. 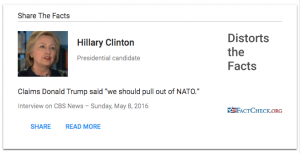 You can share these fact-checks – and many more – using the Share the Facts widget created by the Duke Reporters’ Lab and Jigsaw, a technology incubator within Alphabet, the parent company of Google. We encourage you to post the widgets on Facebook and Twitter, or even embed them in articles and blog posts. On the first night of the convention, Massachusetts Sen. Elizabeth Warren is slated to speak. She has previously painted GOP nominee Donald Trump as a “small, insecure money-grubber,” and she’s likely to repeat previous attacks on his finances. One claim we might hear is that Trump was “hoping for” a crash in the housing market back in 2006 so he could profit – which PolitiFact rated Mostly True. Another claim Democrats have repeated – that past federal tax returns show Trump “hasn’t paid a penny in taxes” – didn’t hold up as well to PolitiFact’s checking. While Trump has declined to release recent tax returns, records show that he did pay income taxes in some years during the 1970s. The second night of the convention is scheduled to focus on how “Hillary has spent her entire career working to make a difference for children, families and our country,” according to the convention website. One campaign-trail claim Clinton has made on that theme is that she worked with Democrats and Republicans to create the Children’s Health Insurance Program. President Obama is set to speak on the convention’s third night, which will have a theme of “Working Together” – something the president and his one-time rival have had to do many times since 2008. Another economic claim Clinton has made is about her Republican opponent’s opposition to the federal minimum wage. While Trump has suggested he’d like to see workers earn more than $7.25 an hour, PolitiFact reports, he has said he would prefer to leave that up to the states, without any federally mandated minimum. Clinton will take the convention stage on Thursday night. As the former secretary of state, Clinton has compared her own foreign policy chops to Trump’s, which she considers lacking. However, FactCheck.org found she goes too far when she claims that Trump said he boosted his foreign policy experience by running a Miss Universe pagent in Moscow. What he really said was he knew Russia well because of it. We imagine no Democrat in Philadelphia will even say the word “email” if they can avoid it. But if you want to separate fact from fiction when it comes to the scandal that engulfed Clinton after leaving her post as secretary of state, multiple fact-checkers have broken it down. Republican nominee Donald Trump’s 75-minute acceptance speech on the last night of the GOP convention sent fact-checkers into overdrive. PolitiFact, The Washington Post and FactCheck.org all produced roundups of their research into dozens of Trump’s claims. Here’s a look at four of those claims and the resulting fact-checks, which you can share using the Share the Facts widget. The widget was created by the Duke Reporters’ Lab and Jigsaw, a technology incubator within Alphabet, the parent company of Google. 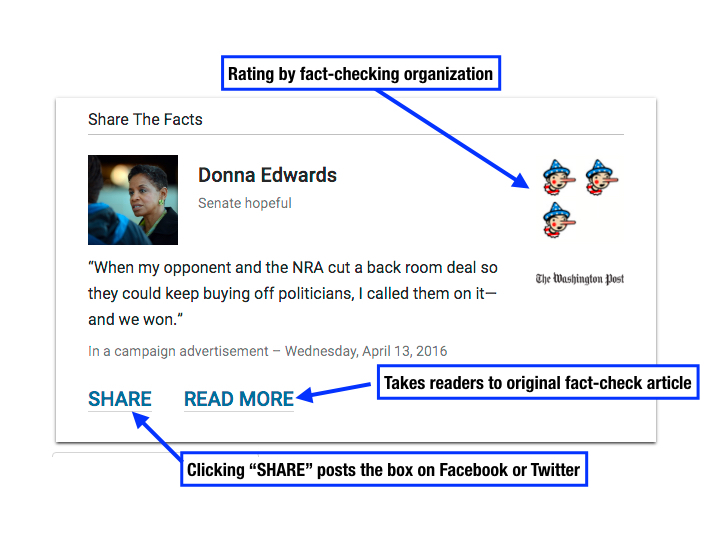 We encourage you to use the widget to share fact-checks on Facebook and Twitter, or even embed them in articles and blog posts. Here’s how the three fact-checking organizations currently using the Share the Facts widget weighed in on this Trump claim. Click “Read More” on each widget to see the facts behind their conclusions. According to the fact-checkers, this claim from Trump had serious problems. While Clinton has proposed allowing as many as 65,000 Syrian refugees into the U.S., fact-checkers find Trump’s claim that “there’s no way to screen” is not true. While the fact-checkers note that Trump has a credible source for his numbers (The Post, in fact), they find he’s guilty of cherry-picking data to give the impression of a scary trend. Politicians love talking points. The scripted lines provide consistency for campaign messages and quotes that are often irresistible to journalists. Talking points are used repeatedly, even by a candidate like Donald Trump who is known to stray from his script. With the Republican National Convention about to start, we thought it would be helpful to show some of the stock lines we expect to hear and how the nation’s fact-checkers have judged their accuracy. 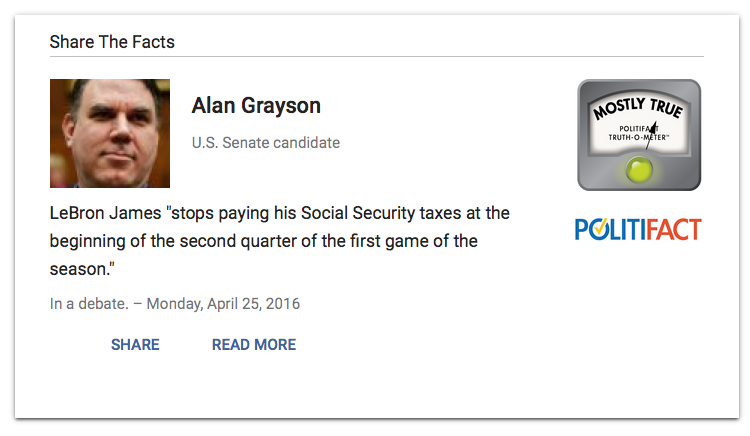 It’s also an opportunity for us to showcase the Share the Facts widget, our new tool that summarizes fact-checks. 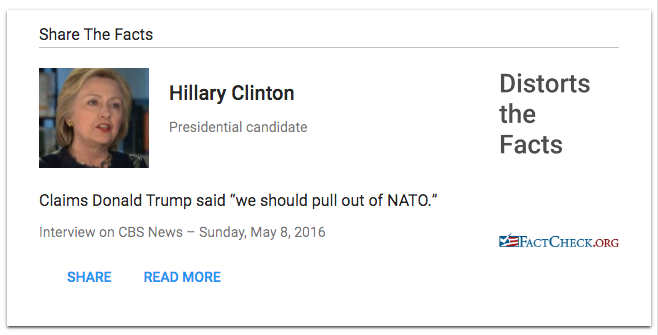 For the past several months, PolitiFact, The Washington Post and FactCheck.org have been using the widget, which was created by the Duke Reporters’ Lab and Jigsaw, a technology incubator within Alphabet, the parent company of Google. The three fact-checking outlets have already created more than 1,000 widgets, mostly from the 2016 presidential campaign. We encourage you to share the facts by posting the widgets on Facebook and Twitter, or even embedding them in articles or blog posts. According to The New York Times, the first night of the convention is set to focus on the attack in Benghazi, Libya, that killed four Americans during Democrat Hillary Clinton’s tenure as secretary of state. Here’s a look at one Trump claim that FactCheck.org found didn’t hold up to scrutiny. Another issue expected to be in the spotlight on Monday night is immigration – an especially hot topic for Trump, who has proposed “a total and complete shutdown of Muslims entering the United States until our country’s representatives can figure out what is going on.” He says the president has the authority to do it, and The Washington Post’s Fact Checker found he’s largely correct. Trump earned four Pinocchios from the Post for a claim tying crime to immigration. The second night of the convention is scheduled to have an economic theme, so we expect to hear claims about taxes and trade. FactCheck.org has noted that Trump is fond of repeating that American taxpayers pay more than residents of other countries – which it found isn’t true (though the U.S. business tax rate does rank among the highest in the world). Trump also speaks frequently about the U.S. trade deficit with China, and he’s accused Clinton of making it worse. But PolitiFact found he’s assigning the blame in the wrong place, since the secretary of state has a small role in trade policy. Keeping with tradition, Trump is expected to speak on the last night of the convention – a speech that is sure to produce many claims for fact-checkers to examine. As he accepts the party’s nomination, he may repeat an assertion about his vote totals in the primary elections that PolitiFact found is mostly true. Stay tuned throughout the Republican convention for more opportunities to share the facts. 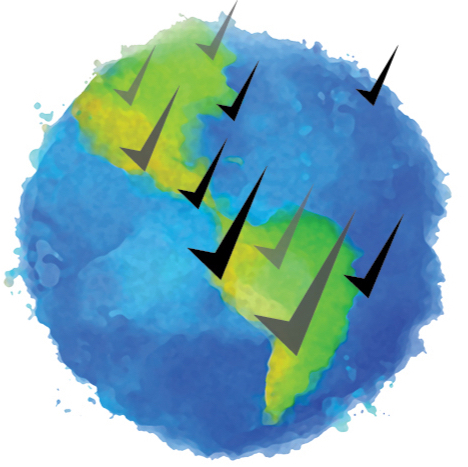 Duke Reporters' Lab and Jigsaw develop easily shareable tool to expand fact-checkers' reach. 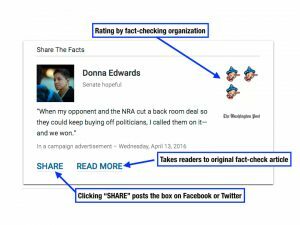 The Duke Reporters’ Lab is introducing Share the Facts, a widget that provides a new way for readers to share fact-check articles and spread them virally across the Internet. The compact Share the Facts box summarizes the claim being checked and the fact-checker’s conclusion in a mobile-friendly format. The widgets have a consistent look but can be customized with the fact-checkers’ logos and ratings such as Pinocchios or the Truth-O-Meter. The standardization allows readers to recognize fact-checking whenever they come across it on the web and to post Share the Facts on social media and by embedding the boxes in articles and blog posts. The widget summarizes fact-checks and allows readers to click to the original article. Fact-checkers can create Share the Facts boxes using a simple template developed by the Reporters’ Lab. The form generates the HTML of the box that can be pasted into content management systems or embedded in the same way as Tweets. Share the Facts boxes are also fully machine-readable, enabling new ways of assembling automated collections of fact-check findings from across the Internet. For example, someone could set up a page that compiles Share the Fact boxes from a single event or a particular candidate. Share the Facts will be helpful to columnists and bloggers because they’ll be able to compile and display several boxes for a debate or a candidate the same way they embed tweets. Share the Facts was developed by The Reporters’ Lab and Jigsaw, a technology incubator within Alphabet, the parent company of Google. The widgets are customized with the logo of the fact-checking site. The widget has been tested in the past few weeks by The Washington Post, PolitiFact and FactCheck.org. The Reporters’ Lab has been incorporating feedback from those sites and will be making the widget available to other fact-checking sites this spring and summer. For articles from FactCheck.org and other sites that don’t use rating systems, the widget can include a short text explaining the conclusion.